She contacted me in May about shooting her wedding, and though I wasn't available that day, we decided on doing a "Just Married" shoot when they returned from their honeymoon. 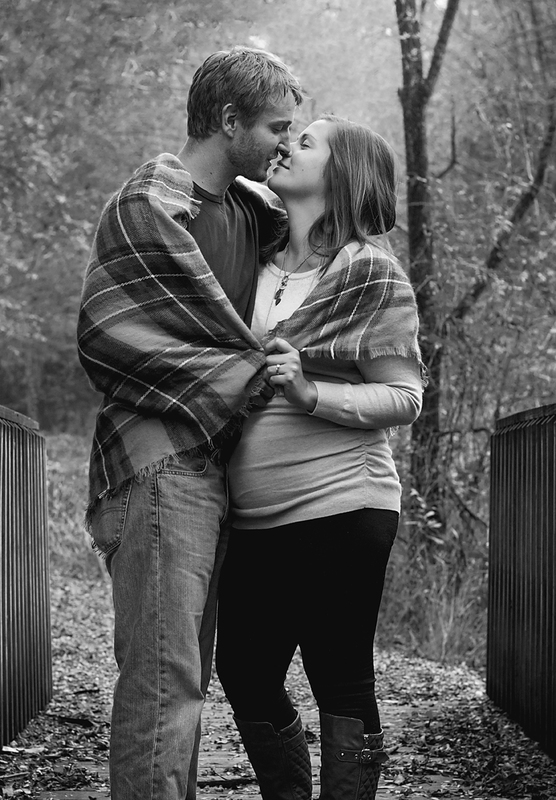 Fast forward a month and our shoot evolved into a "hey, can we wait til fall and make it a maternity shoot?" Other than the obvious and catching up with someone from high school, there were a few other awesome things about this session. The image above is such an amazing example of why I love to collaborate with clients rather than run the show. We saw this bridge, but there was a somewhat steep embankment to get down to it. I casually mentioned that I was totally up for getting in the water if they wanted to shoot there. Jeremy didn't hesitate to start climbing down and helping Kelly down. So off my shoes went... and this was the result. It was so cold, but oh so worth every second. This little girl is going to be blessed with such amazing parents. Both so amazingly sweet, full of love and laughter- it's the perfect environment for this little one to enter. I am looking forward to meeting this little one. I really hope she is blessed with the same laugh as her dad, because his laugh was so genuine and contagious. Kelly and Jeremy- don't sweat a thing. You are both going to be fantastic parents. Just keep loving each other the way you are now, and you'll have all the support you'll need in each other. I look forward to seeing how beautiful this little girl is going to be. P.s. I wasn't kidding about the most romantic couple ever. Just try not to feel the love oozing out of this photo.